A. Biblical Passages: Gen. 6-8; Matt. 24:37,38; Lk. 17:26,27; I Pet. 3:20;II Pet. 2:5. B. The story of Noah and his family being spared from a world- wide deluge (a judgment by God) is one of the most important in the Old Testament. Much is learned about the nature of God from this story. For example: (1) It shows He is a holy God and cannot tolerate sin. (2) It shows He is a just God and that sin will not go unpunished. (3) It shows He is a God of mercy in that He spares some. (4) It shows God's power in that the Flood unleashed great power. It is almost certain that Noah did not construct a standard wooden ship of the kind we are familiar. According to nautical engineers the longest wooden vessel ever built was 360 feet in length and was not seaworthy. Because of the wave action of the sea only wooden ships shorter than this will be seaworthy. Therefore, we must conclude that Noah used some other method of construction to overcome this problem. 1. The Biblical word for Ark is "tebah". It is used 28 times in the OT and is only used of Noah's Ark and for the container in which Moses was hidden among the bulrushes. Because of a similar Egyptian word meaning "box", and the ultimate purpose of the Ark, we believe the Ark was not like a streamlined vessel designed to easily glide through the water. More likely it was shaped like a rectangular barge which floated rather low in the water. From the story in the Bible, it also would appear that Noah had no control over the vessel. He, and it contents were at the total mercy of God. 2. The Ark had three stories with only one door. The phrase in Gen. 6:16, "Make a roof for it and finish the Ark to within 18 inches of the top." is problematic in that the words used are obscure. Most commentators believe it means leave an 18 inch space at the top that is open all around the vessel. This then would be for ventilation, and when water entered it would drain out somewhere below, similar to the vents in cars. 4. The phrase in the NIV (6:14) "make rooms" is also problematic in that the word is obscure. The Hebrew is "qnm". Since Hebrew did not have any vowels when it was written, scholars speculate that the word could be either "qinnim" or "qanim". The former would mean either "rooms" or "nest", and the later, "reeds". Most English translations translate as in the former. However, some of the better and more recent commentaries, believe it should be translated "reeds" since the context is building materials. If in reality it is "reeds", then somehow reeds were part of the construction material. Large boats are still made from reeds and are very seaworthy. The Egyptians still use reeds for caulking their wooden ships. A. It is given in cubits as being 300 cubits long by 50 cubits wide and 30 cubits high. A cubit in the OT was generally about 17.5 inches. However, an Egyptian royal cubit measured about 20.5 inches. Since Moses was educated in Egypt we must allow for the possibility that the longer measurement was meant here. The Ark, therefore, could have measured from 437 feet to 512 feet in length! It was not until the late 19th century that a ship anywhere near this size was built. The Ark had a ratio (length x width x height) of 30 x 5 x 3. According to ship-builders, this ratio represents an advanced knowledge of ship-building since it is the optimum design for stability in rough seas. The Ark, as designed by God, was virtually impossible to capsize! It would have to have been tilted over 90 degrees in order to capsize. Though the Bible does not say, it seems reasonable that Noah employed a large group of workman to build the Ark. If Noah started building the Ark soon after God spoke to him, then the process of building the Ark may have taken close to 120 years. The Bible says in Gen. 8:4 that the Ark came to rest on the mountains (plural) of Ararat. At the time Moses wrote Genesis Ararat was a mountainous region located in what is today Eastern Turkey. The Bible only gives a general location for the final resting place of Noah's Ark. Contrary to what many Christians believe, the Bible does not say the Ark landed on the Mt. Ararat of today. There is, however, compelling evidence from ancient history that the Ark landed on a mountain about 200 miles south of Mt. Ararat. Josephus seems to be referring to this mountain, and he claims it still existed in his day. An Arabic historian says the last remains of the Ark were hauled away about 1000 A.D.
1. The Human Passengers. II Pet. 2:5 says 8 souls were saved. We assume this means Noah, his wife, his three sons, and their wives. 2. The Animal Passengers. In Gen. 6:19ff. Noah is instructed to bring mated pairs of every kind of bird, every kind of animal, and every kind of creature that moves along the ground. In Gen. 7:2ff. He is more specifically instructed to bring seven mated pairs (14) of clean animals and seven pairs of all birds. a. The Number of animals. Only air-breathing animals needed to be included on the Ark. Authorities on taxonomy estimate that there are less than 18,000 species of mammals, birds, reptiles, and amphibians living in the world today. We might double this to allow for extinct species. This would gives us 36,000 species times 2, or 72,000 animals. Adding for the clean animals, we might say there were as many as 75,000 animals. Earlier we said there was room enough in the Ark for 125,000 sheep, but most animals are smaller than a common house cat. There appears to be plenty of space for the preservation of the animal life. However, some creationists believe there may have been far fewer animals if Noah only took on board pairs of "kinds" as the word is used in Genesis 1. God created these "kinds" with potential for rich genetic diversity. For instance, at the time of Christ there existed only two types of dogs. All the diversity we see in the modern breeds of dogs came from these two! b. The Care of the animals. Noah was instructed to include food for the animals (Gen. 6:21). How Noah and his small family could have cared for this large menagerie is unknown, not to mention the sanitation problem! What we must remember is that this event, i.e., the Flood, had supernatural elements. For instance, the animals came to the Ark against their natural instincts (Gen. 6:20). It is therefore reasonable to assume, as some creationists do, that the animals' metabolism may have been slowed down during their confinement, even to the point where some of the animals may have gone into a state of hibernation. A. The Ark of Noah is a rich picture of the salvation provided by Christ who today is our Ark of safety. 1. God took the initiative in sparing Noah and his family. "But God demonstrates His own love for us in this: While we were still sinners Christ died for us." Rom. 5:8. 2. There was a divine and human side to the Ark as Christ is both human and divine. 3. There was only one door to enter into the Ark as there is only one way to God and that is through Christ Jesus. "I am the gate for the sheep..." Jn. 10:7. See also Acts 4:12. 4. There was great security for the passengers of the Ark. Likewise, if we are in Christ we are secure. See Rom.8:31ff. I. Introduction: The first 12 chapters of Genesis are attacked more than any other passage in the Bible. It is very important for believers to be assured that this is no less the Word of God and is important for our instruction. We must not be tempted to prostitute ourselves to a higher authority than Scripture. If the science of geology did not exist, and we only had Genesis chapters 6-8., what would we conclude from a normal reading of Scripture about the extent of the Flood? There is little doubt that a universal Flood is meant. Regardless, some evangelical scholars still postulate that the Flood was a local event. a. There would be no need for an Ark (definitely not an Ark the size of the one described in Genesis 7). b. The Biblical language is universal. 1. The main objections are its supernaturalism and the fact that it contradicts the conclusions of modern uniformitarian geology. (a) The language of the Bible is universal. "all the high mountains under the entire heavens", "Every living thing", "all mankind", "Only Noah was left, and those with him in the ark." (b) The tradition is universal. A catastrophic flood seems to be found in the collective memory of all ancient peoples. Some 270 of these stories have been cataloged. What is interesting is the fact that the closer you get to Asia Minor, the closer the details are to the Biblical account! 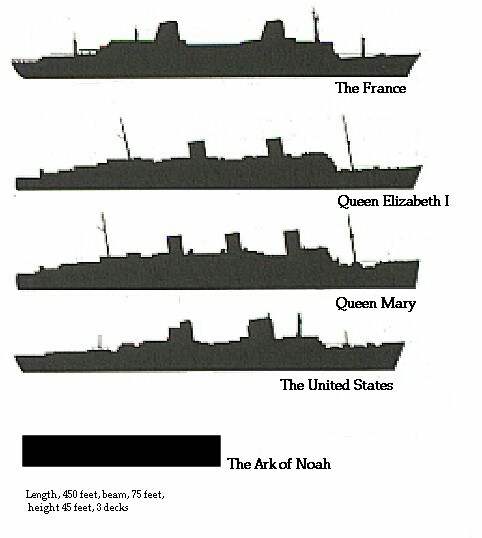 (c) The size of the Ark. It is an ocean-going type of vessel befitting a global catastrophe. (d) It explains the geosphere in terms of Biblical revelation. The huge extinction of animal and plant life told by the fossils speak of catastrophe. (e) The Duration of the flood. They remained in the Ark for a whole year! (f) It ignores the testimony of the apostle Peter. II Pet. 3:3-7. Peter is speaking in global terms. (g) It ignores the stated purpose of the Flood-to destroy all of the human race. (h) The Covenant God made with Noah after the Flood would be meaningless if the Flood had just been a local event. The Bible speaks of the Flood as being a judgment from God due to wickedness on the earth. IF THE FLOOD WAS INDEED GLOBAL THEN THE SIN MUST HAVE BEEN OF THE MOST HEINOUS NATURE! Genesis 6: 1-4 is one of the most puzzling passages in the entire Bible. The major questions of interpretation are: Who are the "daughters of men", the "sons of god", the "nephilim", and the "heroes of old"? a. Explanation: The "sons of god" were the righteous line of Seth; the "daughters of men", the unrighteous line of Cain. The sin which gave rise to the judgment was the sin of intermarriage between the godly and ungodly. (1) This view hardly explains the severity of the Flood? (2) "Sons of god" in all other occurrences means "angels. Job1:6, 2:1, 38:7; Ps. 29:1, 89:6; Dan. 3:25. (3) "men" means the same things in verse 2 as it does in verse 1. (4) The Bible does not say that angels are sexless. Angels in heaven do not marry: the same as people. Matt. 22:30, Mk. 12:25, Lk. 20.35-36. Angels are spoken of as being male (Michael and Gabriel) and as female (Zech. 5:9)! (5) It does not explain the offspring produced. (6) It runs roughshod over the passages in I Pet. 3:19,20; IIPet. 2:4,5; Jude 6. (7) None of the sons of god were on the Ark. (8) The contrast is between the "sons of god" and the "daughters of men" not between the sons of Seth and the daughters of Cain. (9) If the "sons of god" were godly, why did they do what is ungodly? (a) Explanation: A powerful, elite took for themselves multiple wives. There are parallels of this in ancient near-eastern literature. (1) It gives too much emphasis to creation myths and not enough to Scripture. (2) Again, does this explain the severity of the judgment? (a) Explanation: This unholy union resulted in demon-possessed men. (b) Objection:Use of the term "sons of god in other OT passages does not refer to demon- possessed men. (a) Explanation: Angels (spirit beings) left their proper spheres (the spirit world), took on bodies of men and cohabited with the daughters of men. This unholy union threatened to destroy the Seed through which the Deliverer would come. Apparently the "nephilim were some sort of hybrid. As a result, the earth was filled with violence. (1) it explains the severity of the flood. (2) It agrees nicely with the theme of Genesis which demonstrates the sovereignty of God in preserving purifying "the seed" as Satan tries to corrupt and destroy it. The marriage of fallen angels to daughters of men somehow corrupted the seed of man, perhaps causing some kind of genetic mutation. Noah and his family were chosen perhaps because their blood-line remained untouched. (3) It does justice to the text. (4) It explains a difficult passage in I Pet. 3. and Col 2:15, I Tim. 3:16, and explains why women should cover their head! ICor. 11:10. (5) It is an ancient universal tradition that the gods once visited this earth in the form of men, i.e. the titans of mythology. (6) It has strong support from extra-biblical literature-- the pseudopigraphic book of Enoch and the book of Jubilees. The New Testament writers were familiar with these books. Jude quotes from Enoch and Peter alludes to it. (7) It was the universal interpretation of the early church fathers until the 5th century. The major objection to this view is angelic spirit-beings co-habiting with humans. It is a hard interpretation, and is hard to explain philosophically, i.e. the mind-body problem. 1. A rapid shifting of the Poles. 2. The collapse of the vapor canopy surrounding the earth. 4. The shifting of the earth's crust. 5. An extra-terrestrial body passing close by the earth.